1. We are going to create an abstract Employee class and an abstract calculatePay method. The abstract Employee class will prevent a programmer from creating an object based on Employee. Only objects based on Salaried and Hourly will be allowed. The abstract calculatePay method in Employee will force the child classes to implement calculatePay. 2. We are going to implement Polymorphism and dynamic binding by creating generalized methods that accept generalized Employee objects to collect input and display information. However, in the main method we will pass derived objects of the Employee class into the methods. •	Zip the project files. •	Put the zip file and screenshots (Word document) in the Dropbox. Notice in the updated UML diagram that the Employee class is designated as abstract by having the class name Employee italicized. Also, the calculatePay method is italicized, which means that it is an abstract method and needs to be implemented in the derived classes. Create a new project and name it CIS247B_WK6_Lab_LASTNAME. Copy all the source files from the Week 5 project into the Week 6 project. Before you move on to the next step, build and execute the Week 6 project. 1. Make the Employee class abstract. 2. Define calculatePay as an abstract method. Implement the calculatePay method. Since calculatePay is not declared as an abstract method in Employee, all subclasses of Employee must provide an implementation for calculatePay. Unlike the Salaried class, the Hourly class does not currently have an implementation for calculatePay and this will cause an error! We are also going to implement error handing this week using a try/catch block. Specifically, you should wrap the code used to acquire and set the life insurance amount and vacation days in try-catch blocks as shown below. The “try” portion of the code looks for an error. If an error occurs parsing the integer, it jumps down to the “catch” portion of the code and displays the error message. Because badInput is still true, it loops back to the “do” and starts over. Once the integer is parsed correctly, badInput is set to false so it exits the loop and correctly sets the value for vacation. 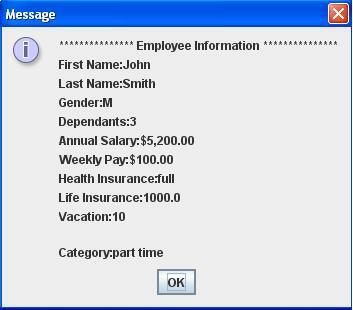 Create a method called displayEmployeeInformation that accepts an Employee object, provides an output header string, and then displays Employee information. Create a method called displayNumberOfEmployees to display the number of employee objects. 2. For the first employeeList index, create a Salaried employee. 3. Call the collectEmployeeInformation method, passing in the Salaried object. 4. Use the displayEmployeeInformation method to display the object’s state. 5. Use the displayNumberEmployees method to display the total number of Employees created. Remember, this includes both Salaried and Hourly employees. 6. For the second employeeList index, create an Hourly employee. 7. Repeat Steps 3-5 for the Hourly object. 8. As an educational exercise, you can try to create an Employee object to verify that an error will occur. When done, compile and execute your code, and debug any errors until your code is error-free. All of the output values should match last week’s output.